What Can We Learn From Our Animal’s Future Life? In this past life, Princess Penelope cautions against giving our power to others; the answers we seek lie within us. Penelope, do you want to show us (Leona and me) another life? Princess Penelope would like to show us a life in the future. Penelope, in this future life, tell me about yourself. I’m a cat. 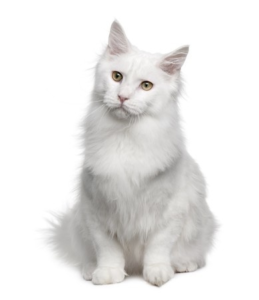 An extraordinary white cat. I am unbelievably beautiful and pure. Penelope, I’m not seeing this life as on this earth. No, no, it’s a spiritual life. And Leona is all white and beautiful and pure. And I am an oracle. She is the keeper of the oracle. I don’t mind life revolving around me at all. I rather like it. It’s sort of a reversal. Wisdom flows through me. And so, the roles are reversed. It is more important to keep me alive than to keep the ones who come to me or the one who keeps me alive. I would like you to turn this idea over in your mind and consider it. That the life of myself as the cat, as the oracle, is more important than the surroundings. And I would like you to see the injustice in this, just as there is injustice today with it reversed. All life is valuable. Spiritual is not the right word. It is another place, another time. So, Penelope, why do people come to you? They come to hear the truth. Some come with very specific questions. Some come with more profound questions, but oftentimes I tell you, they have given away their power. The answers lie within themselves and they have given that power to me to give them answers for their lives. I do not ask for that power, but when they come to me, I give them what they ask. Penelope, what is the lesson for us in this picture that you’re giving? The lesson is NOT to give away your power. Would you tell us more about this? Leona already knows this. The answers do not lie outside of her; they lie within her. It is still good that she asks, because each question gathers more information. But you cannot gather leaves and make a tree. You have to plant the seed to make a tree. The seed is within her and it will grow. It is not outside of herself. The power is within. Is there anything more Princess Penelope that you’d like to say? My name was not Princess Penelope. (Chuckling) Yes, I’m sure. It was more like The Magnificent or something like that.